World 6-1 is the first level of World 6 in New Super Mario Bros. It introduces Bill Blaster Turrets. This level is filled with Bullet Bills that are fired from Bill Blaster Turrets. When Mario reaches a thin ledge, he can either hang onto it or walk on it. When Mario is on the thin ledge, it is harder for him to jump than usual. If Mario Wall Jumps on the wall after the thin ledge, he will be able to get the first Star Coin. After the checkpoint, Mario should jump to the left to get the second Star Coin. Below another thin ledge, after many Bullet Bills, is the final Star Coin. After the third Star Coin, Mario will reach the flagpole. 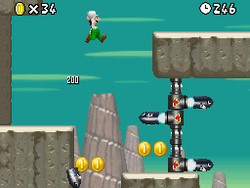 Star Coin 1: After the third Bill Blaster Turret, Mario should go on the next platform (on the right of the hole, followed by the trail of coins), then Wall Jump. Star Coin 2: The second Star Coin is before the checkpoint, and instead of going right, Mario should go left. Star Coin 3: Before the flagpole, Mario should take the lower route and go on a thin ledge and hang on it. This page was last edited on April 6, 2019, at 01:43.